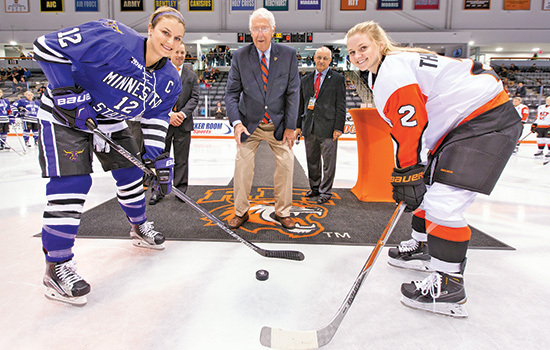 Trustee Emeritus Bruce B. Bates drops the puck at the RIT Women’s Hockey game versus Minnesota State in October. It was part of the ceremonies at the Gene Polisseni Center announcing the endowed chair that bears his name. The Bruce B. Bates Women’s Hockey Coach is the university’s first named endowed coaching position for Tiger athletic programs. RIT Trustee Emeritus Bruce B. Bates, who joined the board in 1970, is providing the gift, from which endowed earnings will support the salary of the women’s head hockey coach and provide budget support to athletics. The endowment in athletics will be similar to those in academics at RIT. The donation is invested, and a portion of the return is distributed each year. When funded, the endowment will include commitments of more than $1.7 million. Scott McDonald who recently signed a five-year extension to lead the women’s hockey team through 2020, will be the first recipient to hold the endowed chair. McDonald, now in his 10th season at RIT, led the Tigers to the 2012 Division III National Championship. In three seasons as a Division I program, he has led RIT to two College Hockey America Championships, and RIT’s first berth into the NCAA Division I Tournament. Lou Spiotti Jr., executive director of Intercollegiate Athletics, said he is “thrilled for our women’s hockey program and for athletics at RIT, in general.